Quinny and Hopper are unstoppable. Together, they tamed a killer chicken, broke the Third Grade Rules, and proved to everyone that they could be best friends. But Hopper has doubts that anyone--even Quinny--can save him from his impending doom: a surgery removing tonsils he is really, really not ready to part ways with. To help Hopper overcome his tonsillectomy fears, Quinny decides to reveals his birthday surprise early: a trip to a museum where they'll get to see a real brain up close and personal. Hopper needs something to live for. But Quinny is torn when her sometimes-friend, sometimes-enemy, Victoria Porridge, invites her to the most amazing party ever on the exact same day. 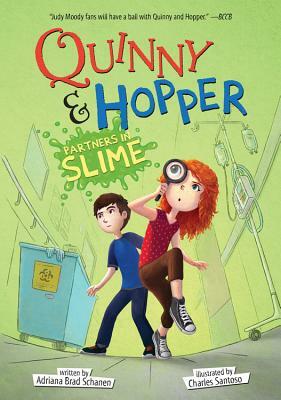 Quinny and Hopper are back in this hilarious and heartfelt sequel about friendship, changes, and staying true to yourself. Charles Santoso loves drawing little things in his little journal and dreams about funny, wondrous stories. Some books he's illustrated include I Don't Like Koala by Sean Ferrell, Ida, Always by Caron Levis, Penguin & Tiny Shrimp Don't Do Bedtime by Cate Berry and the New York Times bestseller Wishtree by Katherine Applegate. He is currently working in sunny Singapore. You can visit him at charlessantoso.com. "The book is engrossing, and the likable duo change and grow in believable ways. Quinny and Hopper, who take turns narrating, have distinct, well-differentiated voices, and Schanen makes good use of her individuated secondary characters as well. Swearingen's black-and-white drawings both capture the spirit of the characters and enhance the narrative. This endearing story about true friendship should appeal equally to boys and girls."